You’ve decided on the adventure of a lifetime – a long visit to Alaska! Maybe you’ll hike in Denali, or maybe you’ll take a train across Alaska. Maybe you’ll visit the Last Frontier’s historic and rugged small towns. Maybe you want to wing it and see what the road has to offer. In any case, you’re the type that doesn’t want to carry a lot of baggage (physical or otherwise) on your adventure. We’ve developed some tips for you so you can pack light and still have along all the necessities for an adventure in Alaska. Save the Louboutins for your voyage to Milan and instead stick with a good pair of walking shoes or hiking boots. 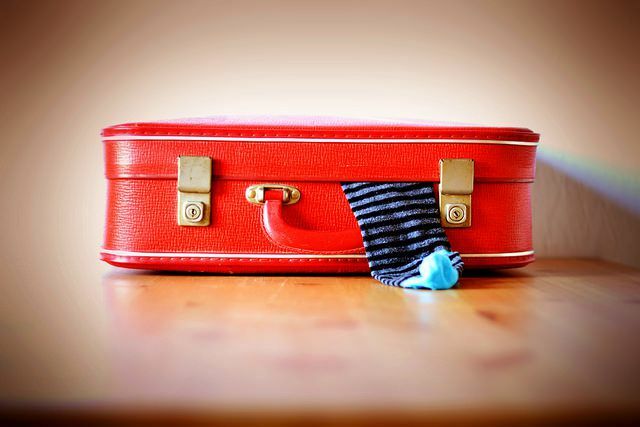 It goes without saying that you should wear these on the plane (or in the car, however you’re getting here) instead of packing them in your suitcase. Can you make it to Alaska with just a carry-on? Sure. But like a true pioneer, you’ve got to brace yourself for roughing it, wardrobe-wise. Even if you’re traveling in the summer, you’ll want to bring layers. Temperatures can hit nearly 90 degrees Fahrenheit, though if you hit one of those days during your visit, it would probably make the local news. Maybe even national news. More likely you’ll see temperatures around the 60s on average, dipping into the 50s for the evening. You’ll want long sleeves and long pants. A fleece jacket or vest is a really good idea. One pair of shorts (make sure they’re neutral so they go with everything) should be sufficient. Even better: try convertible sport pants that zip into shorts. A couple of short-sleeved shirts or blouses would be fine, but make sure you’ve got something to layer underneath them. A great option for staying warm and packing light is to bring along silk long underwear – it’s a natural fiber, so it will help you stay dry, and it’s warm enough for chilly mountain weather. It’s thin enough to wear under dress shirts and blouses without much fuss. It’s highly packable and dries quickly, so washing in the sink and hanging in your hotel room or cabin overnight will ensure its availability the next day. Wear other quick-dry wicking clothing for hikes, and bring your water resistant jacket. That, you can wear on the plane, too. OK, bring along a nice outfit. You want to be ready for anything, right? Search travel clothing companies like TravelSmith or ExOfficio for packable dress clothes that resist wrinkles when you stuff them to the bottom of your bag. When you shake it out for a fancy salmon dinner, it’ll be ready. There’s a whole debate on whether rolling or folding saves more space. You can spend your time arguing about it, or you can just roll up your clothes and stuff them in your carry-on. Trust us on this. It works well for most kinds of clothes except wrinkle-prone cottons, and there’s not much you can do about those anyway. Westmark Hotels has irons, anyway. Westmark Hotels also has laundry facilities, so you can wash and wear. Just make sure you bring at least one change of clothes, please. You might be ready to empty the contents of your storage closet, dragging out all of your mountain-climbing and camping equipment. You can rent most of that kind of equipment through outfitters or retailers like REI. Check before you go and save yourself some serious packing space. Westmark Hotels can supply you with toiletries like shampoo, conditioner and soap. But be sure you don’t forget to leave space for the essentials like your prescriptions, glasses or contacts, and your camera equipment for recording those special wildlife encounters you know you’ll have. It’s a good idea to bring sunscreen, bug repellent and a simple first aid kit for blisters and scratches, though you also can buy those when you get here. Remember, whatever liquids you bring in your carry-on luggage must meet Federal Aviation Administration rules: Each bottle must be no larger than 3.4 ounces (100 ml) and you are limited to a 1-quart plastic bag of them. Still not sure? Check with Westmark Hotels staff – as you plan your excursions, they’ll be able to tell you what kind of conditions you might encounter on your long trip to Alaska.